What’s your Chinese New Year’s Resolution? The first of January signals the start of a brand new year in much of the western world, but it’s far from the only time that New Year festivities occur around the globe. While you may determine the year based on the Earth’s rotation around the Sun, there’s at least one civilization that takes the lunar cycles into account when deciding when to declare the start of a new year. Chinese New Year is an exciting event that brings together citizens of the world’s most populous country for a week or two of fireworks, feasts and celebration. This year, Chinese New Year kicks off the Year of the Monkey, and it all goes down on February 8, 2016. Here at Palace of Chance, the excitement is just too much to bear. That’s why we’ve launched a set of Chinese New Year promotions to get you into the Spring Festival spirit. Light a few firecrackers and crack those fortune cookies, because it’s time to enjoy some of the best promotional offers that the online casino industry has to offer. The stars are aligned and the feng shui is just right. Fortune might be on your side! Once every 12 years, the Year of the Monkey emerges to shower fortune down upon people around the globe. Traditional celebrations such as lion dances and dragon dances are punctuated by family gatherings and the distribution of lucky red envelopes full of cash. Palace of Chance is giving you a selection of lucky red envelopes in the form of deposit bonuses that will supercharge your playing power. No matter what type of casino game suits your fancy, we’ve got a deal that will have your bankroll flying higher than a paper lantern. Want to learn a little more? We thought so! For slots and keno players, we’ve got two amazing deals that are sure to bring you great fortune. Confucius says take advantage of the 560 percent bonus on your next deposit of $70 or more. This deal features a 30 times playthrough restriction and a 10 times max cash-out limit. If the rules aren’t your thing, we’re also offering a 350 percent no-rules bonus that’s available on every deposit of $50 or more all January. If you’d prefer to play table games, the 160 percent no-rules bonus is for you. This offer is available on any deposit of $30 or more and can be applied to nearly every game in the Palace of Chance. We don’t need to enlist the services of a fortune teller to know that our VIPs have really got it made with this month’s exclusive promotional offers. You’ll be screaming, “新年快乐!” all night long after activating one of these three generous bonuses. For slots and keno aficionados, we’ve got two incredible deals. First, there’s the 630 percent bonus, which features a 30 times playthrough restriction and a 10 times max cash-out limit. Then, there’s the no-rules 370 percent bonus, which can be used on any deposit of $50 or more. If you’re more of a table games player, fear not; we’ve got you covered as well! The 230 percent no-rules bonus will supercharge your next deposit of $30 or more, and it can be applied to almost every game in the casino. When the deals are this good, ringing in the New Year is a truly festive occasion. Celebrate with your Asian friends living in countries around the world by cashing in on these lucrative Chinese New Year promotional offers. Now that you’re familiar with the bonuses we’re offering this month, it’s a great time to make a deposit and get on your way to your first big win. If you need some help applying these offers to your deposit, or if you’d like to learn more about joining the exclusive ranks of the Palace of Chance VIPs, just navigate to the ‘Contact Us’ page of this website. Our industry-leading customer support team is standing by 24 hours a day to help address all of your questions and concerns. Whether you prefer to communicate over the phone or on the web, Palace of Chance has the perfect option. 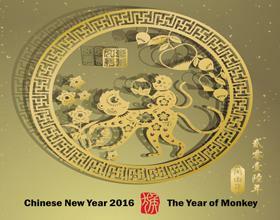 Ring in the Year of the Monkey, and enjoy the good fortune that could be heading your way. 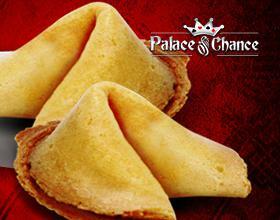 When you play at Palace of Chance, amazing bonuses are just the icing on the cake!